Don Henderson – Resource Concepts, Inc.
With over thirty years of professional experience, Mr. Henderson has specialized expertise in the agricultural disciplines pertaining to rangeland science and ecology, livestock management and planning, public land administration and permitting, rangeland monitoring, livestock and wildlife interactions, threatened and endangered species, wild horse management, arid land reclamation, and environmental assessment. Mr. Henderson’s senior level position requirements frequent administration of complex multidisciplinary projects. Mr. Henderson has nine years of experience with the Nevada Department of Agriculture. His four years as the Department Director provided Mr. Henderson with valuable administrative experience, with broad and wide-ranging knowledge in agricultural production systems on a state, western, and national basis where numerous legislative and agency contacts were established. Since returning to RCI in 2007, Mr. Henderson’s work experience has focused on rangeland management, monitoring, inventory, and public land grazing permit issues. This focus has added to Mr. Henderson’s work experience and expertise, and has resulted in several professional certifications including: Certified Range Management Consultant, California State Range Manager Certification, and certification as a Technical Service Provider (TSP) for the USDA Natural Resources Conservation Service in the areas of grazing, forages, and land treatment. Mr. Henderson is well-known and respected for being able to successfully work with often opposing parties to develop consensus livestock grazing plans that produce the desired resource and economic outcomes. Mr. Henderson has spent his life enjoying and learning from the western rangelands. 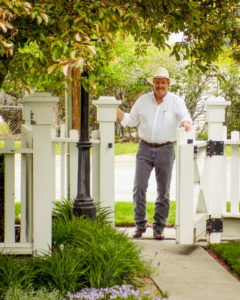 He resides in Gardnerville and, when work and home life allows, he is always ready to get out to explore and learn more about the wide-open spaces in the spectacular Intermountain West. Since 1985, Mr. Henderson has remained continuously involved in supporting the mission and activities of the International Society for Range Management with his time and abilities. Occasionally you will find him fine-tuning his limited golfing skills on a local course or a tropical vacation.